chair with simple plywood seat on tubular metal frame. Note the way that the tubular frame is angled in immediately behind the front legs to make the back rail narrower than the space between the front legs. The chairs could not be stacked vertically but facing the same way they could slide together into lines for storage. 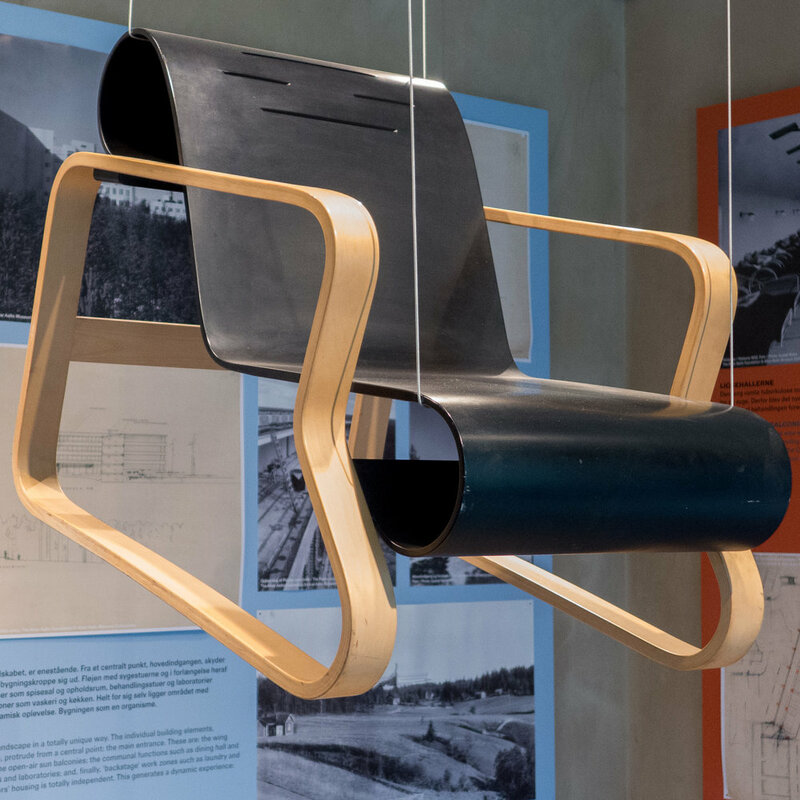 Today two comments came through on a post on this site ... my review for a recent exhibition at Designmuseum Danmark about the buildings and two of the chairs designed by Alvar Aalto for the Sanatorium at Paimio. The comments raised several important points. One was that the initial version of the Paimio Chair did not have slots in the back of the head rest and these were introduced later. A photograph from the 1930s shows this chair used in the lounge of the hospital - an area for patients that had large windows overlooking the forest and part of the dining room but screened off from it by folding doors. The chairs are shown set out in four rows with the chairs facing parallel to the windows and not towards them and with all the chairs in a row facing in the same direction. This suggests that they were not arranged for socialising or conversation but to create a place where patients could sit quietly and rest. There were side tables between the rows - the Ring Table - a version of the Side Table 915 still made by Artek - with two ‘loops’ of bentwood that support a top tray and a shelf in plywood and both with the ends bent upwards. Looking at the photograph none of the chairs appear to have the slots in the head rest. The slots were said to help air circulate around the face of the patient - tuberculosis is a disease that compromises the lungs and breathing - so when were the slots introduced and for which building? The second comment was that the Armchair shown in the exhibition was not the version of Armchair no 42 that was used in the hospital but that the chair used at Paimio had a much more pronounced bend of plywood at the front edge of the seat than the chair in the exhibition. This is curious because a drawing showing the side views of both the chairs and details of the bentwood frames was included in the chapter by Katrina Mikonranta in the volume on the Sanatorium published by the Alvar Aalto Foundation. * There, it is dated to 1934 and is labelled “preliminary drawing for the patent application for the production method of the Ring Chair (Paimio Chair) and Spring Chair (Armchair no 42)” and that shows the version of the armchair that was shown in the exhibition. Looking through the historic photographs available, I have not been able to find any views of rooms in the hospital at Paimio with this chair so which version of the chair was used and in which rooms? This proves, yet again, just how much a carefully-compiled concordance for the work of a designer can contribute. This is particularly important where designs are brought back into production, sometimes under a different name and sometimes made by a different company, and for early designs, both before and after the war, a cabinetmaker or workshop might well be producing a design in small batches with a changing workforce and, of course, many designs do evolve and can be modified deliberately over years of production if new or better materials are available or when new machinery for the workshop was developed. The mistake that was completely mine was the ambiguous or badly-written sentence that implies that it was these bentwood chairs that were used on the terraces and the comment points out quite rightly that outside there were tubular metal recliners and again these can be seen in historic photographs. This correction is an opportunity to add slightly more about the furniture for the Sanatorium that was not strictly relevant in the review of the exhibition because that focused on the two chairs. In fact, furniture for the new building was not included in 1928 in the initial terms of the competition to design the Sanatorium and Aalto submitted a separate proposal for furniture in March 1932 that was accepted by the Committee on 1st June. Kaarina Mikonranta, in her chapter on Paimio Interiors,* appears to show all the furniture for the hospital itself including an arm chair with a seat and back from a single piece of bent plywood with a wood frame that was used in the entrance hall. Still produced by Artek and now called Chair 403 'Hallway', these arm chairs were also used in the bedrooms for the patients. The rooms had two single beds with bed-side cabinets and a wardrobe with a curved door in plywood and across the window, which came down low to admit as much light as possible, there was a deep shelf across the width of the room, just inset from the window, to form a desk or table and photographs from the 1930s show rooms with two chairs drawn up to the shelf where patients could sit in front of the window. Aalto designed a simple plywood seat on a cantilevered tubular metal frame, a simplified version of a Bauhaus chair that was used in the sanatorium reading room. Kaarina Mikonranta has included among the illustrations a fascinating photograph of at least 41 of the plywood shells of these chairs, on edge and pushed together as a batch, on the floor of the dining room and 37 versions of the same chair with a wider plywood seat where a long slot along the edge of the shell meant that an arm rest could be bent upwards on each side to form what was identified as Chair no 28. There was a wider version of the shell of Chair no 28 that appears to have been covered in leather and was set on a wide metal base to form a chair for the Chief physician's workroom. Clearly all these plywood shells were waiting to be assembled. For laboratory benches, there was a stool with a pyramid-shaped frame in metal strip, rather than tube, to support a round seat with a very low back piece and in the dining room there were good, simple, wood chairs with four legs and a back rest that could be stacked and are described as a “row chair”. The offices of the Sanatorium staff and their accommodation in the villas and apartments on the site were also furnished and included hefty upholstered armchairs with the distinct frame of the Armchair 41. Today, by coincidence, along with the email with the comments on the post, there was also a news letter from the furniture gallery Jacksons who specialise in Scandinavian and international vintage design. There was a photograph and a link there to an exhibition that they curated in June 2013 and called Paimio Sanatorium at Design Basel where they showed an amazing display of not just the furniture from a bedroom but doors, lighting and, of course, the washbasin and spittoon. These are some of the best photographs on the internet of the furniture in the rooms of the patients at the sanatorium and show the window shelf, door handles, and the Paimio Hall Stool.